Every so happy often I meet my friend who is reading the first draft of my current novel and we discuss a few chapters at a time or, as this time, the dreaded synopsis. We live a two hour drive apart, so we meet roughly half-way at a rather nice country hotel. All well and good. We found our usual place, but then a rather loud group sat down by us. The alcove in the next room eventually became vacant, so we moved there. Time came to leave before the rush hour. She left first. I was opening the car door when I checked that my glasses were still hanging round my neck as the chain is rather fine and inclined to slip off. No glasses or chain. They must have fallen on the drive, I thought. We were so engrossed in conversation walking to the car park that I didn’t notice whether I had my spectacles or not. I spent the next half an hour looking at every leaf on the asphalt drive from door to car and searching on the carpet round the two places where we had been sitting, in the Ladies, by the cloakroom and then asked the people now sitting where we had been to get up so I could look at the chairs and under them. People were very patient and helpful, but no glasses. I would have to drive back without them. About fifteen years ago I had cataracts very effectively removed in both eyes, except only after the operation the surgeon informed me that my right eye was the reading one, and the left one was long distance! I imagined they would both be one or the other and I would have to have glasses to adjust my sight either for reading or for long distance. Ah! I thought, the surgeon was thinking precisely of the situation I’m in. How wise. My left eye would take me back home. The time spent looking for the dratted bifocals lost me the head start I had on the rush hour. The sun was sinking in magnificent red fury. No matter, I would be heading eastwards. So I set off and managed as normal along the A63 to the A1 and took the correct turning to Hull on the M62, avoiding shooting past and finding myself on the way to Manchester. So far, so good. The sunset shot a bright burnished russet disconcertlingly into the mirror so I tried to avoid looking at it too much. I didn’t overtake. Err on the cautious side, I said to myself. It’s not much past five and your meeting this evening is at seven. Keep calm. The sunset was breathtaking; I wish I could have looked at it properly. So I listened to the evening news and kept up a steady 70 miles an hour until I realised that I didn’t recognise the side of the motorway. Then I went under a bridge and the dreaded truth dawned: I had overshot the exit for South Cave and then Beverley and was heading towards the unknown territory and urban sprawl of Hull. I stopped at a garage and said I was lost. How can I get to Beverley? It was the next exit, but cars were tailing me and hooted when I slowed down to check the signs – white lettering on green isn’t easy to read in the dark with cars crowding you – green is greedy with light. I had forgotten how headlights look like stars on one’s lenses. Fine, I could see clearly ahead and the line by the side of the road with my left, long distance lens, but if I looked across the barrier or in the mirror, the lights dazzled. 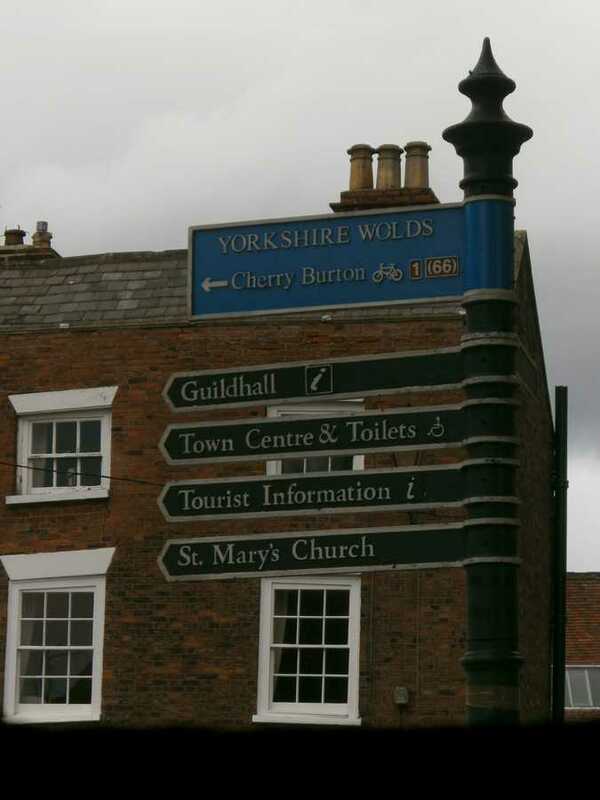 I continued in the hope I would find a roundabout with signs to Beverley, but instead had to stop at a toll gate. Help! We don’t have tolls on motorways, so what is this? ‘How can I get to Beverley, please?’ I asked the man in the booth. He blinked and frowned. Nice of him. The Humber estuary is wide. I don’t often take this road south to Lincoln and East Anglia. He didn’t tell me the roundabout was 15 miles away along a fast dual carriageway with no turns. At long last a roundabout, but I took the wrong exit, unable to read the signs, and found myself on a country road. It was dark by now. I knocked at a cottage door. A dog barked. A woman opened it and explained I would have to turn round and take the third exit on the roundabout. I must have looked distressed as she invited me in for a cup of tea. No, I had to return. I was supposed to be at a meeting. Back at the roundabout I took the third exit, hoping it would be the turning to the Humber Bridge. It was another minor road. I knocked at another door and a man again told me to turn round and take the second main exit or the third if you counted a small one. Back at this huge roundabout I went round and round and round as if in one of Dante’s circles of hell. No good. I couldn’t read the signs. John knew I would be late for the meeting so he would go alone. I pulled up on the verge near a petrol station, not seeing that there was a fence. A surge of panic. Calm yourself, I whispered – this happened many a time. So I decided to walk round the circle and read the signs. The rush hour was over. As I paused to let a huge tanker pass, the man in the cab leant out and asked if he could help. The road back to the Humber Bridge was, he assured me, the first exit. It was. Fifteen miles later the man at the toll booth said I had to pay £3 because I had taken over an hour to return. Yes, Beverley was straight over the next roundabout – and after that it was clearly signposted – little use to me. Only seven miles. That shouldn’t take long. There were at least six roundabouts before reaching Beverley, and from one I ended in a dead end on a housing estate. 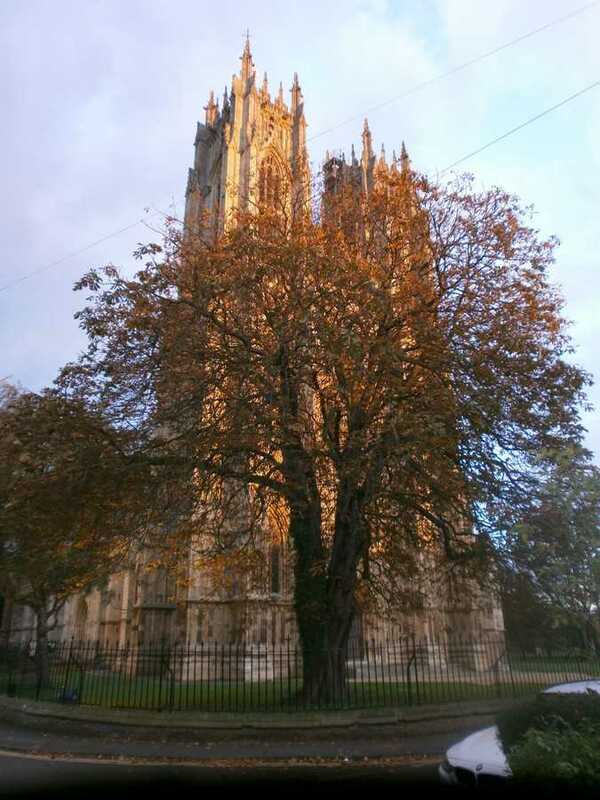 At last I saw the floodlit Minster! Home safely. By then I was trembling. I had taken three hours to do an hour-long journey. I went late to the meeting. The hotel phoned the next day to say the glasses had slipped behind the seat of my chair.